It all started with a trip to a military surplus warehouse sale where I picked up a bag of dirty used numerical display tubes, also known as Nixie tubes. They used to be used to display numerical data on electronic equipment such as frequency counters, multimeters, etc. before other numerical display technology such as the LED or LCD displays were developed. The tubes were neon filled light bulbs basically, and the neon would glow around the cathode wire inside the tube when voltage was applied to the corresponding pins. There is now a bit of a resurgence in their popularity for making digital clocks, and there are several rescources online that sell kits and the old Nixie tubes. I got the tubes along with a dishpan full of other electronic parts for $25, so I wanted to make my own clock from scratch rather than build a kit using a ready made printed circuit board. This page displays my project of building a Nixie tube clock. I did some research on the internet and found quite a variety of dealers selling Nixie tubes as well as kits to make your own clock. Just about all of them used programmable PIC integrated circuits, but I wanted to make mine with just standard logic chips. I came across a project from Europe, see link below to Peter's Nixie Clock Page, and found a schematic for a Nixie clock that uses 4017 decade counter chips along with some switching transistors to drive the Nixie tubes. I took a look at my Nixie tubes and discovered that they were 9 pin mini, or Noval, tubes. So I wondered how you could display 10 different numerals using only 9 pins. Turns out that these are Burroughs B5025 tubes, and were pretty uncommon using a dual anode, or biquinary circuit. Normally each of the 10 numerals, 0-9, are connected to one pin for the cathode of each numeral, and there is a single anode (plate equivalent) for all 10 digits. In my tubes, there are 2 anodes, and each of 5 different pins were connected to 2 numerals, one even and one odd. Pin 2 is the anode for all the odd digits, and pin 9 is the anode for all the even digits. So if you want to display a 1, you would use use pin 2 as the anode (a1), and pin 8 as the cathode. To display a 0, you would still use pin 8 as the cathode, and use pin 9 (a2) as the anode. Therefore, you had to have 2 switching circuits and select both the cathode and anode for each digit. I finally found a webpage showing a circuit using ZM1030 dual anode tubes, see link below. However, that clock used a programamble PIC microcontroller, and I just wanted to use a simple counter. I also came across Peter's Nixie Clock Page, also linked below, that showed a circuit using ordinary decade counter CMOS chips and some switching transistors for the high voltage drivers, but that project used regular 11 pin single anode Nixie tubes. I emailed the author of that webpage and he very kindly replied and even drew out a schematic for me to use to use the dual anode tubes with the decade counter. Here is the partial circuit he sent me, this is only the driver scheme for one tube. I took inventory of my parts and have plenty of resistors and capacitors that I use in my radio and audio projects, but this is my first venture in to the realm of semiconductors. The parts I would need for the driver section of the clock would be six 4017 CMOS chips, 20 diodes per tube 1n4148, perfboard, and some transistors, MPSA92 and MPSA 42. I was able to buy all those parts on Ebay for under $20, since they are cheap and commonly used parts. I already had the tubes, tube sockets, and materials to make a nice display cabinet. Still working on this. I have several choices. 1. Use AC house current with a bridge rectifier to make the anode voltage, 180 VDC. I decided against this in order to keep mains potential out of the clock. 2. Use a 12 to 15 Volt DC "wall wart" power supply and an oscillator driven step up transformer and rectifier to make the 180 VDC, and just use a voltage regulator to utilize the power supply DC current for the semiconductor circuit. I had the parts to make this one, and found a schematic and managed to put it together on an old power supply PCB board from a discarded computer power supply. Here is a photo of it with a little neon pilot bulb on it. This board has the oscillator driven by a 555 timer front and center operating at about 68KHz so I could use a ferrite core and hand wound transformer you see on the right as the step up transformer. I also glued the tiny little clock circuit pulse generator you can see at the left front corner of the board. The power supply is plugged in and you can see the neon pilot lamp lit up to show the high voltage is present. I had originally used a lower frequency 680 Hz oscillator and an audio 70 volt line matching transformer which worked prefectly but the transformer gave off an annoying high pitch hum, so I changed it to the higher frequency (68KHz) to quite it down and also saves space and weight as the little ferrite coil is a lot smaller than the line matching transformer. 3. Use a 12 to 15 Volt AC "wall wart" power supply, and then have an ordinary step up transformer and rectifier to make the 180 VDC, and another rectifier and voltage regulator to make the 12 VDC for the semiconductor circuit. 4. The above power supply was a bit on the large side measuring about 4 x 6 inches, and I wanted to have a smaller clock, so I hunted for some other power supply circuits. 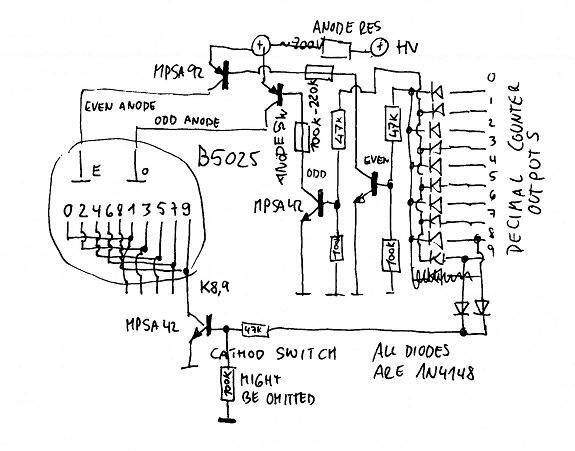 I came across a "cascade multiplier" circuit in an old Radio Shack handbook that uses only diodes and capacitors to increase an AC voltage and put out a higher DC voltage. It works sort of like series voltage doublers. I needed about 180 volts DC for lighting up the Nixie tubes, 12 volts DC for the circuitry, and 1.5 volts DC to run the clock pulse generator. The circuit board pictured below ia a little less than 2 x 2 inches. It used 8 capacitors and 8 diodes for the 180 volt DC supple, a 1N4001 Zener diode with a filter capacitor that runs through a 7812 voltage regulator for the 12 volts DC, and then used a 337 variable voltage regulator with the corresponding resistors to put out 1.5 volts to the pulse generator. I had to experiment a lot with the high voltage to have something small enough, but still get the 180 volts. I couldn't get enough voltage with my prototype using a 12 VAC wall wart power supply, and found a 32 Volt AC 500 mA in the drawer. I found that a cascade of 8 diodes and 8 capacitors gave me 178 volts DC output when the input was 32 volts AC. The capacitors and diodes needed to be rated at 2 times the input voltage, and I had a bunch of 1N4148 diodes that I bought for the driver circuit with voltage rating of 70 volts, and a bag full of the electrolytic capacitors that are 22 uf at 100 V, and they seemed to work quite well, and so far, no smoke or fire, and nothing even got warm with a test load. Cascade multiplier powering a nixie tube showing small size about 1.5 x 1.5 inches and puts out 180 VDC, 12 VDC and 1.5 VDC to power the Nixie tubes, the 4017 IC chips and the timing pulse generator. Here is a photo of the clock above, the flash washes out the number displays, but shows the cabinet. It has display tubes for hours, minutes, seconds, and tenths of a second. It is fun to watch the tenths fly by. The cabinet is not as I originally planned it since the chassis was bigger than I could fit in the original design. The cabinet is made of solid walnut with beveled edges and a smooth lacquer finish. This photo shows the clock without the camera flash so you can see the digits light up a little better. I found quite a few options for the timer circuit. Basically I needed a 1 Hz pulse generator to drive the first counter and advance the clock once each second. Some of the circuits used the 60 Hz house current timing and divided it down to 1 Hz, another used a 555 timer circuit, and still others used crystal oscillators for the pulse generator. Scrounging around the house, I found a few old broken analog wall clocks that had been given out by pharmaceutical reps, the kind that use a 1.5 Volt AA battery and a regular clock display with hour, minute and second hands. After disassembling the small drive mechanism and removing the gears, there is a tiny little circuit board inside that has only 4 connections, 2 to the battery and 2 to a coil of wire that acts as a driver electromagnet for the clock motor. I hooked up a 1.5 volt battery to the supply terminals, and my little multimeter to the wires that go to the solenoid coil and found that there was a tiny pulse of electricity exactly every 1 second, but that the first pulse was posivite, and the second pulse was negative etc. The pulse duration was very short with no current flowing during the remainder of the cycle. I am still working on how to use the alternating + then - pulse to drive the counter, which needs about a + 0.5 volt signal to trip the counter. I am pretty sure that it will register the + pulses, and might also register the - pulses on the upswing side of the pulse. Otherwise I will use a little bridge rectifier with 1N4148 diodes and hope I don't lose too much voltage and can still trip the counter with what is left of the pulse after going through the diodes. In building the Nixie tube clock there was a delay getting the parts, so I started on a project building a 4 digit timer to be used as a pace clock for the kids' swim team. A commercial unit costs several hundred dollars, so I wanted to build a small portable 4 digit pace clock with numbers big enough to see from a moderate distance. The digital clocks at the airport use digits about 4 to 6 inches so I thought 4 inch digits would do. I started with a Radio Shack black plastic project box that is 5 x 7 x 3 inches, and started gathering the rest of the parts and figuring out a circuit for the timer. It used four 4026B ICs which are decade counters with 7 segment LED decoding output, that are usually used to drive 7 segment LCDs, so I needed to use a transistor to get enough current to the LEDs, which take 20 mA, and the 4026B only puts out about 2 mA, which is enough to energize a transistor to switch on the current to the LED segment. Here is the box with the holes drilled to accept the LEDs. Here is the main circuit board, front and back, at the "wires in the air" stage. I used a different color of wire for each of the 7 segments to help with the wiring. Just finished putting the timer together, and made some adjustments in the pulse generator circuit, but here is a photo of the finished product. I will put up some more details of the circuit later. It counts seconds and minutes, ideal for sports timing, like swimming laps etc. It runs on 6 size D batteries, or a 10 volt DC wall wart. When you turn it off and then back on, it resets to 00:00 and counts up from there. The digits are about 4 inches tall so you can see it from about 25 yards away. Peter's Nixie Clock Page This is a page from Europe showing construction of a Nixie clock using only decade counter chips, no computer programmed software involved. Peter helped me with the dual anode circuit modification, Thanks!